Starting from Elementor Version 2.1, we transferred all of our editing controls to a new context menu, that appears when you Right Click a Page/Section/Column/Widget handle. Note: To access the browser’s original right-click functionality click CTRL/CMD + Right Click. Copy/Paste Elements - Now you can simply Copy an element (Widget, Column or Section) and Paste it anywhere on the page. When pasting on top of an element, the pasted element will be placed below it. Tip: Use the shortcut CTRL/CMD + C, and then CTRL/CMD + V, to copy and paste elements. 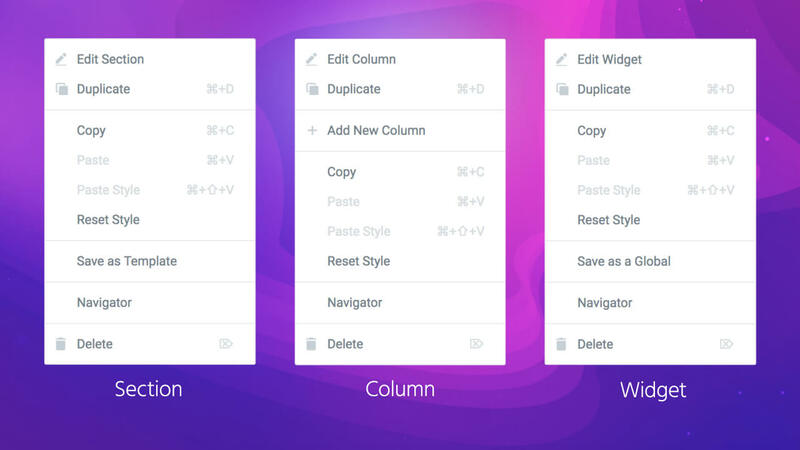 Copy/Paste Element Style - With Paste Style, you can paste the style of any element you copy (Widget, Column or Section), then apply it on any other Widget, Column or Section. Copy/Paste Between Pages - Copy Paste and Copy Style actually work between pages! You can Copy any Widget, Column or Section, and Paste it on a different page on your site. Reset Style - You can easily return to the default style settings of every element by right clicking and choosing Reset Style. Copy All Content - You can copy the entire page content and paste it to a different page. Delete All Content - The ‘Delete All Content’ option moved into the Page Level Right Click. Modify the right click option and choose "Secondary click"